To Enter the website simply enter your User Id and Password, then click “Participant” below. 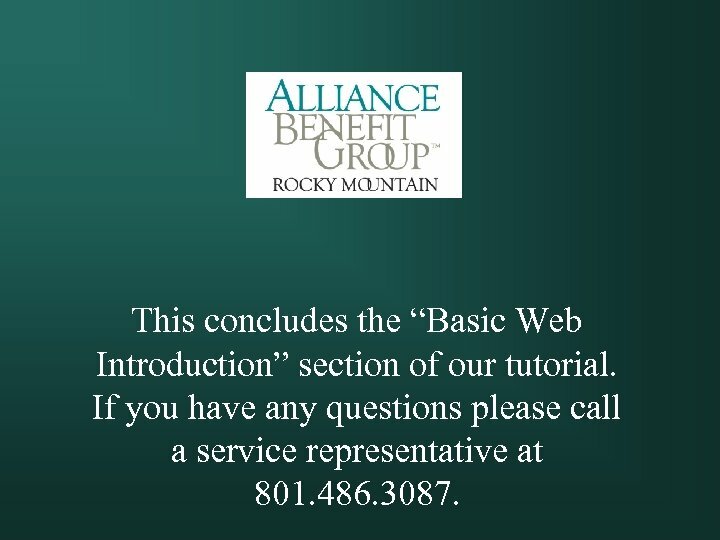 Note: If you do not know your user ID and password please contact a service representative at 801. 486. 3087 This website is available in both English and Spanish. Simply click the “Spanish” option to view the website in Spanish. If you have forgotten your User Id or Password click this option and if you have previously entered your email address, it will be emailed to you. If this is your first time logging onto the website you will be asked to set up an additional “Security Prompt”. Once you have completed this a “cookie” will be stored on your computer and you will not be asked again unless the “cookie” is removed or you log on from another computer. 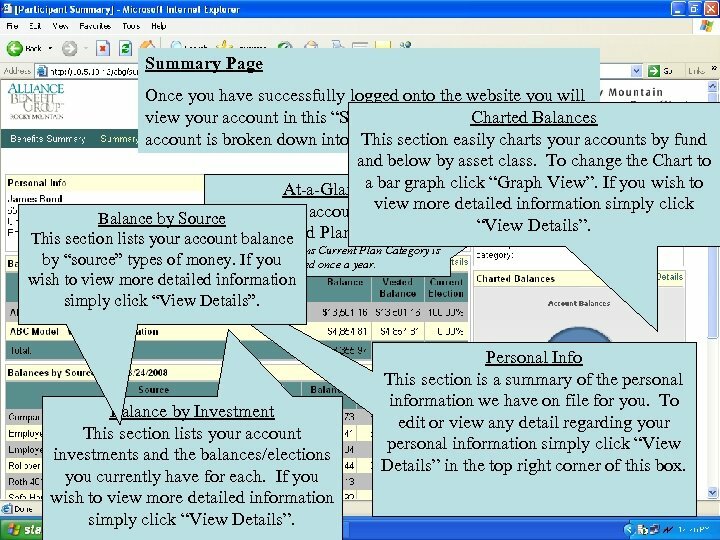 Summary Page Once you have successfully logged onto the website you will view your account in this “Summary” page where your Charted Balances account is broken down into 5 This section easily charts your accounts by fund separate sections. and below by asset class. To change the Chart to a At-a-Glance bar graph click “Graph View”. If you wish to view more Shows your account balances, detailed information simply click Balance by Source “View Details”. division and Plan Category. This section lists your account balance Note: For most plans Current Plan Category is by “source” types of money. If you updated once a year. wish to view more detailed information simply click “View Details”. Balance by Investment This section lists your account investments and the balances/elections you currently have for each. If you wish to view more detailed information simply click “View Details”. Personal Info This section is a summary of the personal information we have on file for you. To edit or view any detail regarding your personal information simply click “View Details” in the top right corner of this box. You may also navigate the website via the menu options on the top menu bar. Simply move your cursor over the menu item you wish to access and pick the subsection that applies. 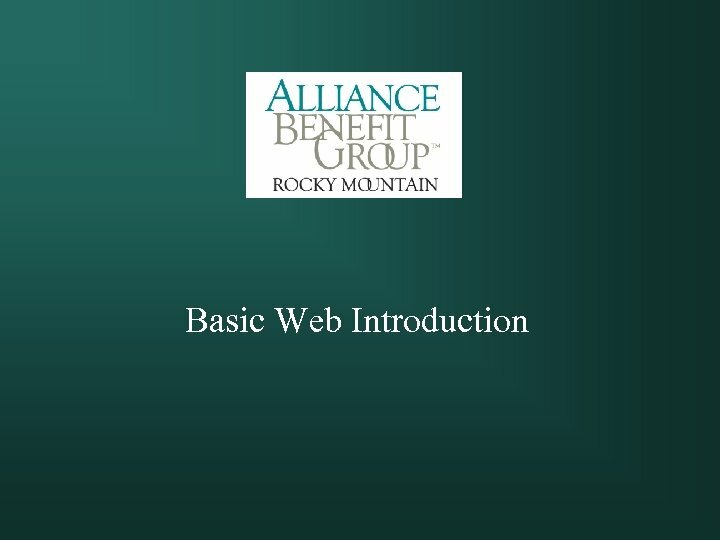 This concludes the “Basic Web Introduction” section of our tutorial. If you have any questions please call a service representative at 801. 486. 3087.